A male nurse keen on proposing to his girlfriend endures a nightmarish visit with her parents. 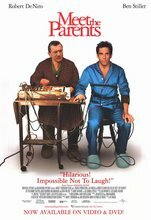 Remake of Meet the Parents (1992). Male nurse Greg Focker, a hapless sort of fellow hailing from Chicago, intends to propose to longtime live-in girlfriend Pam Byrnes, only to learn that her incredibly strict WASP father expects to be asked for his permission to give her hand in marriage first. Enter Pam's Long Island-dwelling family, led by mother Dina and retired CIA counterintelligence officer Jack, intent on throwing Greg for a painful loop as he suffers through a ride full of awkward twists and turns on his way to (hopefully) making Pam "Mrs. Focker".